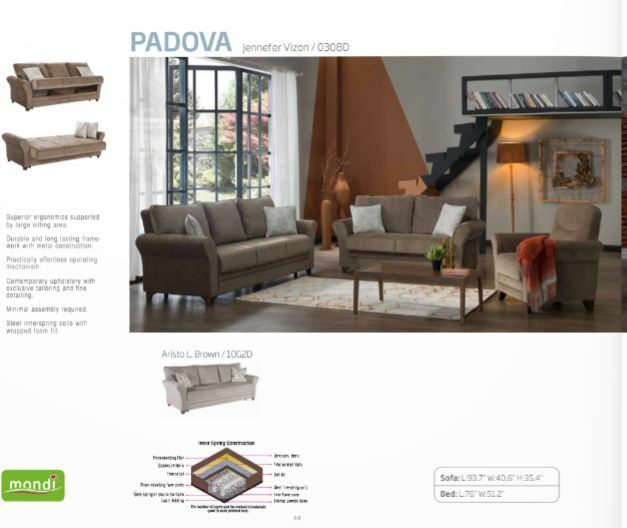 It's perfectly rolled arms and wide sitting area make it hard to believe that the Padova is actually a sleeper sofa. With large cozy cushions and spring and foam construction comfort is never an issue. This wonder of modern engineering is just waiting to be the focal point in your living spac. Practically effortless operating mechanism. Twisting and bending resistant reinforced frame construction. Rust and corrosion resistant galvanized mechanism and fitting parts. Steel innerspring coils with wrapped foam fill. Contemporary upholstery with exclusive tailoring and fine detailing. Minimal assembly required to secure pieces together.